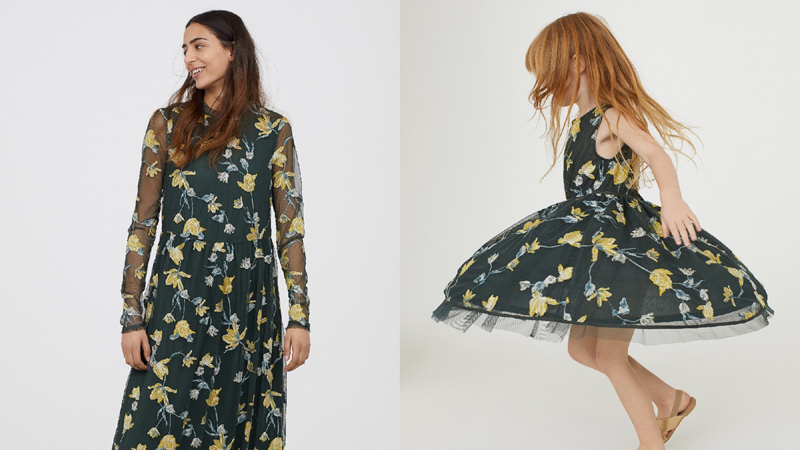 The mini-me adults-and-kids fashion trend is gaining traction globally and H&M wants a piece of the action, revealing a new collection this week that targets a global consumer and uses print and pattern to reach both mothers and daughters. The first drop of the new H&M Ltd Collection appeared in select international stores on Thursday with more due later this month. The pieces seem to have been designed to appeal across geographies from Europe to Asia, the Americas and the Middle East. So think kaftan-style dresses, kimono dresses, long statement skirts, and ruffled blouses or tunic tops with coordinating trousers. The kids’ dresses meanwhile come in the same prints, jacquards and soft sheen materials. Both adults’ and children’s pieces feature hemline embroideries, tulip prints, and soft draping. Colour is also a key focus with bright accents and more “harmonious” shades with a fondness for pomegranate red and lilac pink, fresh whites and deep blues. The second drop will see leafy greens and spicy yellows, plus gold and silver, and a dash of pale lilac, added to the mix. Mini-me dressing has become increasingly popular at luxury level with both brands and retailers tapping into the trend and frequently sending kids down the runway during fashion weeks too. It’s a key way for them to tap into a global kidswear market estimated at $1.4 billion and to target the entire family as Millennial parents continue to spend a huge chunk of their income on their kids.